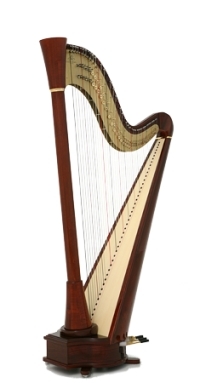 In 1999, we enthusiastically launched our marketing of Camac's exceptional harps in our showrooms across the USA. Camac's innovations please the eye, project beauty to the ear, and are easy on your budget. With steel cables that replace the rigid pedal rods that all other pedal harps use, as just one example, Camac's 21st century harps are more reliable than any other pedal harp maker we know. 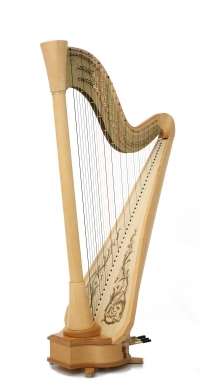 Camac makes a wide variety of models from student harps for the budget that is restricted, to professional quality instruments in various finishes, with carving, gold leaf or with brass decorations reminiscent of the 19th century Erard harps. 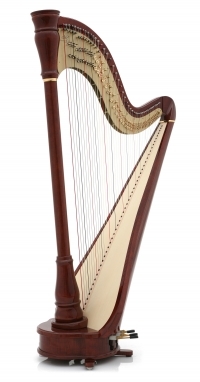 The Athena model is standard in the harp world.